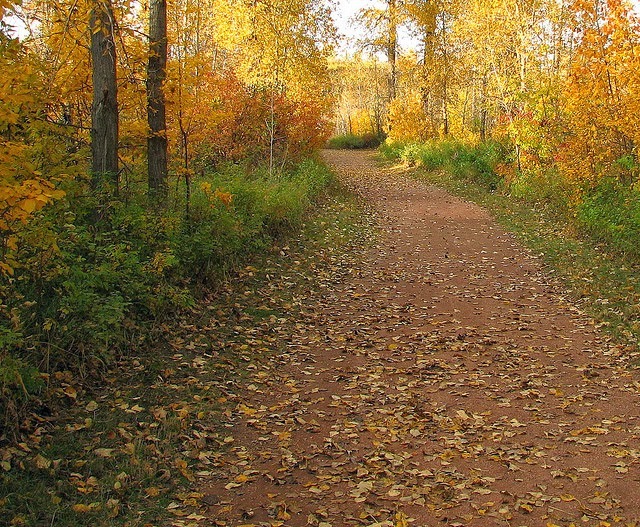 October 2013 – He Said What?! Today we are facing what has become our annual Aaron dilemma at this Halloween time of year. His day group, Paradigm, is having their Halloween party tomorrow. Aaron has helped the staff shop for decorations and other party supplies; he has listened to party plans being made; he has talked about the fact that there will be a party on Halloween………..but now that push comes to shove and the party is actually upon him, he does not want to go. I mean, totally does NOT want to go to the Halloween party. We understand that Aaron doesn’t handle huge social gatherings very well. All the talking and the noise and the stimulation puts him on overload. We’ve had many, many experiences in the past when he was young and we made him go with us to events……….and sometimes we paid dearly for it with deep frustration and very red faces. But this Paradigm party is different, at least to us, and we can’t believe Aaron doesn’t want to go. It seems that he would enjoy a fun day with the staff and clients that he normally hangs out with anyway. He knows he doesn’t have to dress up. Lots of the clients don’t wear costumes. We tried a costume with Aaron for the Paradigm party a few years ago………a mask that wasn’t tight fitting………but he ended up carrying it around all day, or dropping it on a chair, and not wearing it at all. Even the promise of movies and fun food and candy doesn’t make Aaron budge. I think a big reason he doesn’t want to go is because he just sees all the excitement and noise and fun that everyone else is having as being very annoying. It’s out of the norm and he doesn’t enjoy it at all. I think he feels like he has to act in a party way that is so out of character for him that he ends up angry and irritated…….and hateful to boot. Something similar happens here at home on Christmas Eve. We play silly, fun games on Christmas Eve as a family. We always make sure to include Aaron, but he always goes up to his room after hanging around for a short time. The one game that he stays around the longest for is Christmas Bingo. We have a big basket full of small, wrapped gifts………and the winner of each round gets to take one. What could be more fun than that? The thing is, we’re all laughing and talking and being silly…….except for Aaron. Gary calls out the moves, and he is also being rather loud to be heard as well as funny just for fun……….and Aaron ends up getting grouchier and grouchier by the minute. He sees nothing fun about this mess. Even the gifts are hardly able to hold him at the table……but he wants so much to stay. However, he invariably becomes rude and offensive, putting us all on edge and making us hope that soon he will excuse himself. When he gathers up his gifts that he won and heads up the stairs, we breathe sighs of relief and then sometimes feel guilty for doing so. Such is party life with Aaron. Well, no, I realize that I’m not making you have fun, Aaron. “And Mom, I don’t want to go to the Halloween party!” he continued. He was on this one track and not about to take a detour off of it. I tried several times to get Aaron to explain why he didn’t want to go to the party. “Aaron, tell me WHY you don’t want to go to the party. I know you don’t want to go, but explain WHY,” I would say. I opened our newspaper to give Aaron his comics to read. I eventually leaned over the table to look at a few pictures of some local well-known people in their thrift shop Halloween costumes………and Aaron saw me. Saw me looking at HALLOWEEN costumes! We’ll see, but I have a feeling I’ll have company tomorrow. He’ll be happy and relieved to not be at the party, of all things. 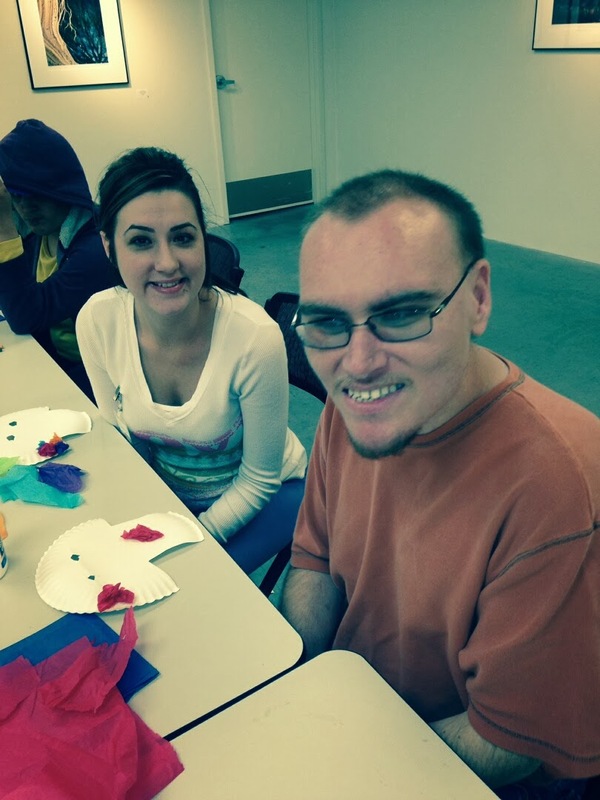 Last week Aaron went with his day group to City Arts, where he made a Halloween mask and also a necklace. He asked Misty, one of his staff, to send me a picture of them as he sat at the table. There he was in the picture, smiling and happy. Aaron, who really doesn’t like anything crafty very well, was having a great time that day. It made me happy, too…………and a little surprised to see him this way when he’s using his awkward fingers to make something. His lack of good manual dexterity usually causes anger, but on this day he was truly having a good time. When he got home that day, he was very excited to show me the mask……….but his greatest animation came when he showed me what else he made. He had crafted a necklace – for me! I was touched as he handed it to me with a huge smile on his face, telling me that he had made a necklace for me!…………and would I wear it? “Of course I’ll wear it!” I answered. I oohed and aahed over it as he stood there watching me slide it over my head. After he was gone, I just looked at his work of art. It was so elementary, so sweet, and I was taken back in time to my very young children as they stood looking up at me…….handing me their little creation that they had made for me, eyes wide with anticipation as they awaited my delighted response and my big hug. Now it was my nearly 29 year old grown son who had handed me a homemade necklace, but he valued my delighted response every bit as much as he and my other two had done when they were 6 years old. I wore my necklace the next day. Aaron was pleased to see me wearing it as we went to his final annual meeting at his day group. It made me feel good to be able to affirm him in that simple way. I had it on when he came home and again he was pleased as I pointed out to him that I was still wearing his special gift to me. But today, Sunday, was a little different. I was all dressed for church. I had set out my necklace and earrings, a matching set that went perfectly with the outfit that I was wearing. In walked Aaron to the bedroom, and there on my dresser he saw the necklace that he had made me. “Mom?” he asked. “Will you wear my necklace I made you today to church?” I paused for a second but I don’t think Aaron noticed it. I was thinking of how I really wanted to wear my perfectly matched necklace…….the one that went so well with my shirt and my jacket, and was a part of the earring/necklace set that I had planned to wear. But how could I say that to Aaron without making him feel like I really didn’t like his necklace? So I told him of course I would wear it, and I reached for it instead of my perfect necklace and I slid it over my head. As I got my jacket on and looked in the mirror, I realized that my Aaron necklace actually matched my outfit very well………..but even if it hadn’t, I would still wear it. However, I must be honest and say that another thought went through my mind. It was one thing to wear this simple necklace with my shirt and jeans the other day, but to wear it with my nicer Sunday clothes was a different matter. How would it look? 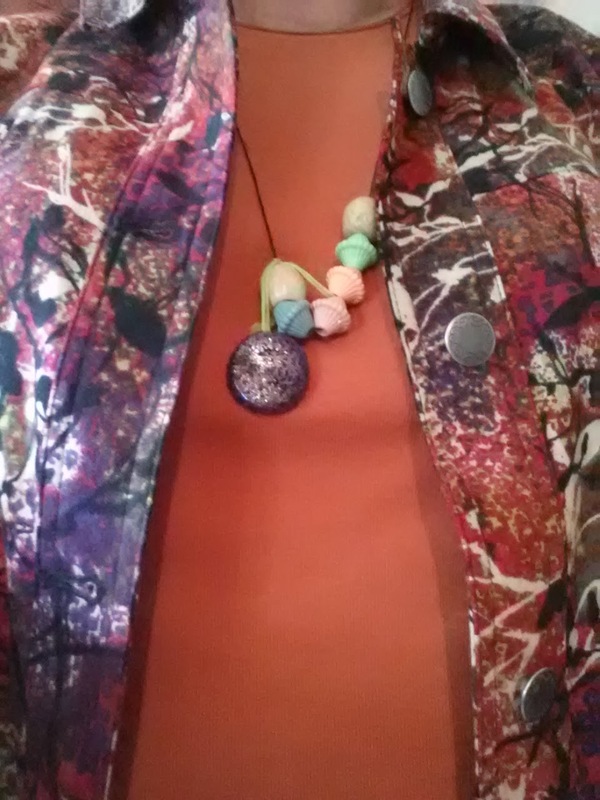 And would I be somewhat embarrassed to be wearing this childish necklace with my “grown-up” clothes? Then I had this thought, sad to say………..the thought that I could tell Aaron I was wearing the necklace, but on the way to church I could take it off and slip on my perfect necklace. Then before coming home I could change back into my Aaron necklace, I thought. But no, as quickly as that plan skittered across my brain, I tossed it aside and felt guilty for even entertaining it. The Aaron necklace it would be, and I would not be embarrassed but instead would hold my head up proudly as I wore my special keepsake necklace. On the way to church I thought of that issue of embarrassment and I remembered yesterday, Saturday. I asked Aaron if he wanted to run down to Dillon’s with me, and of course he was very eager to go to the place where he knew he would surely see many interesting items and then get to buy a special treat. As we walked into the store we passed some boy scouts at the entrance. One of the boys asked if we wanted to buy some popcorn and I declined with a smile and a thank you as Aaron breezed on by, anxious to get in the store and start his exploring. I was looking at tomatoes when Aaron hurried up to me, an artichoke in his hand, a huge smile on his face, and water from the vegetable sprinkler dripping off his hand on to the floor. As usual, he was oblivious to the stares of those around me as he excitedly and rather loudly showed me his find……….and so we had our usual artichoke discussion before he put his first interesting find back in the artichoke pile. Off we headed past the deli section, and as I turned to check on Aaron I saw that he had stopped at the deli counter, where he was intently staring at all the interesting food that was available. I just watched him as he stood there totally motionless, staring at all the yummy food, and then he turned to find me and he smiled broadly when he saw me. I reminded him that we would buy him some cereal today as we saw the display just ahead………and Aaron clapped. “No clapping, Aaron,” I reminded him……..and I was aware of the looks from nearby shoppers who didn’t expect to hear a loud clap in the middle of the cereal display at Dillon’s. Aaron chose his cereal and then followed me to the “cheese area,” as he would say. He was focused on Swiss cheese, unbeknownst to me as I looked for shredded Mexican……….and soon he spied the block of Swiss cheese on the shelf nearby. He was so focused on the Swiss cheese, in fact, that he whizzed right past the nice lady who offered him a sample of rotini. He barely grunted at her as he kept his eyes on the Swiss cheese, never looking at her as she offered her sample to him and certainly not saying a thank you or no thank you or even giving her a smile. She looked completely puzzled and Aaron looked completely happy as he held up his find…….a nice block of his favorite Swiss cheese. And I just smiled at the nice rotini lady and said no thank you as I followed Aaron to the treat aisle. As we stood there looking at the candy, I heard it………..the noise Aaron makes that sounds like someone is passing gas. He makes the most authentic “passing gas” sound that I have ever heard aside from the real thing……..very impressive. But I am quite sure that people around us are equally impressed and are also wondering which of us is the guilty party. “Aaron,” I say loudly enough for anyone nearby to hear, “I’ve told you not to make that noise with your mouth.” Emphasis on “with your mouth” as opposed to what I am sure they are thinking. I didn’t make eye contact with anyone and was relieved to walk away, where we paid for our items at the self-checkout and I kept Aaron busy loading the bags so that he wouldn’t wander away and end up over at Starbucks, where he would totally confuse the poor server there as he has done before. We took our bags, and as I placed our cart in the proper cart line in the entrance I turned and found Aaron examining all the fall gourds in the pretty display. We touched their bumps and ridges and laughed at how odd and grand they were, and then turned to exit the store. That’s when I heard it again. “Aaron,” I reminded him, “I just told you about that noise.” That noise that for some reason echoes in the foyer of Dillon’s like nowhere else……….and I was so aware of all the boy scouts right outside the door. Oh Aaron. This makes all the sense in the world to Aaron in his world, but I explained things to him anyway and he seemed to understand………until the next time. I thought of all these embarrassments yesterday in the short time that we were in Dillon’s as Gary and I drove to church this morning. I thought about these things as I wore my Aaron necklace around my neck as opposed to my perfect necklace that still lay back in my bedroom. Life with Aaron is usually lived Aaron’s way, do or die. There are many ways that life with Aaron is anything but perfect……….yet living this life is what we do. Through all the embarrassments and the frustrations, there is still a certain sweetness to our times with Aaron. We may have to swallow our pride and hide our red faces, but deep down we also have a lot of fun and a ton of joy……..on most days. So I’ll lay aside the perfect and I’ll accept the unusual that is Aaron……..just like my unusual, slightly lopsided Aaron necklace that I wore this morning. I wore it near my heart……..just like Aaron. 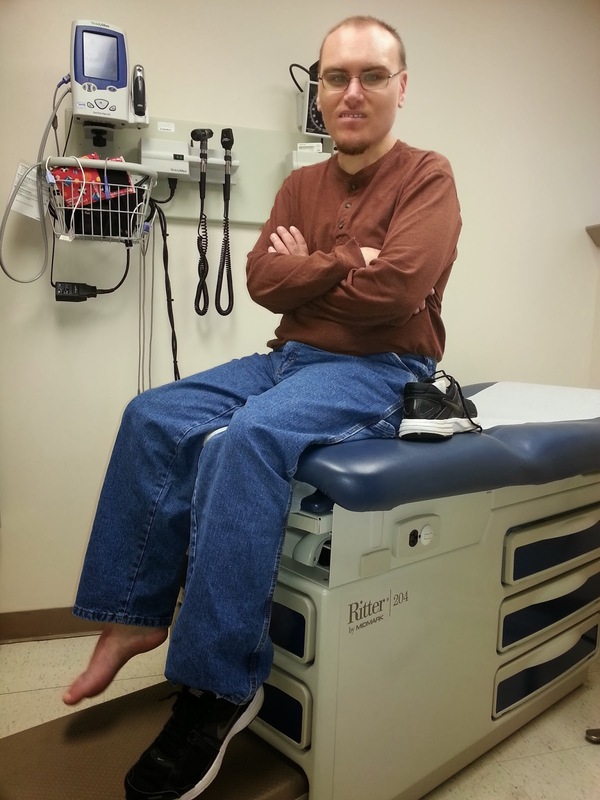 I was awakened early Sunday morning to the unmistakable sound of Aaron having a seizure. I turned the baby monitor on my nightstand down and mentally checked the time as I got out of bed and headed for his room. I have to chart Aaron’s seizures, writing down the time they occur and the duration. He would love the fact that I note the time so precisely………the seizure began at 4:57 and ended at 4:59. The second seizure was two hours later, after we were already up, and again I heard it on the monitor that I had put beside me on the kitchen table. After a while, Aaron got out of bed and slowly made his way downstairs, where he told Gary and me that his head hurt………and we told him about the seizures, which of course he never remembers. He had a normal day, but was lethargic and rather quiet. Then at 2:30 he decided to take a nap, and around 3:30 I heard another seizure – unusual for that time of day. After such a hard day, I was happy to take him to Sonic that evening for his favorite hot fudge milkshake. When we got home, he put the milkshake in his blue bowl, of course, and sat there slowly enjoying it. He was very quiet as he sat there sipping his milkshake. He wasn’t doing his usual talking a mile a minute about everything under the sun……..and even though when he IS talking a lot I sometimes wish for quietness, this silence now was unnerving to me. As I looked at him hunched over his favorite milkshake, I felt a keen sadness. I knew that the reason he was so quiet was because he didn’t feel well……….and he didn’t feel well because of the seizures………and we don’t know why he has seizures………and we can’t take them away. He just looked very alone and vulnerable as he quietly sipped his milkshake. He wasn’t through with his milkshake when he stood up and groaned. At first I thought he was just full, or maybe had brain freeze from drinking too quickly……….but he then told me that his stomach hurt. Stomach aches after seizures aren’t unusual, so I wasn’t alarmed. He lay on the couch, and I turned to go upstairs and get his blanket. “Mom?” he asked as I headed for the stairs, “Will you get my black fuzzy pillow and my black fuzzy blanket?” I didn’t correct him and tell him that his blanket is brown because I knew it didn’t matter at all. When I brought the blanket back, he was giving Gary instructions about what to do with his milkshake. “I don’t want it in the freezer. Will you put it in the refrigerator?” And soon Aaron was fast asleep, a little after 8:00 on a Sunday night. As I sat there looking at him, with football on the TV screen………and Aaron having asked me before he fell asleep about which team I was “voting for”……………I again felt such sadness. Sometimes the reality of Aaron………of his epilepsy and of his autism and just of his life in general…………sweeps over me in waves of sadness. As his mother, too, I am pulled to him and filled with compassion for my son. But sometimes it goes beyond compassion to just plain old sadness………..lump in my throat, tears in my eyes sadness. This was one of those nights. I sat there, aware of the football game that I had wanted to watch, but more aware of my boy on the couch……….sleeping when he should have been drinking his favorite milkshake…….having seizures when he should have been young and vibrant………..living at home with Mom and Dad when he should have been out on his own. I know not to go there in my mind, at least not for long, for it serves no purpose. Yet sometimes those thoughts do come and they do stay longer than I intend……….reminding me of Aaron’s reality, and ours as well. As I listened to Aaron’s deep breathing and watched him sleep, I thought of other families and other children and other situations. I could list so many people that we know who have very serious problems in their lives. I know that Gary and I are so blessed, for things could be far worse for Aaron and for us. I wonder how some of our friends handle the stresses and the heartaches that they daily face. So many people with realities that seem almost impossible to fathom. I remember being in Wal-Mart one day several years ago and coming upon a group of special needs adults on an outing with their staff. It hit me almost like ice water in my face that now my son is one of these special needs adults who goes on outings. He is one that you may see in Wal-Mart or the mall or at the theater. And believe me, if it was Aaron, you would probably hear him as well. But really, I mentally shook my head in disbelief. I never saw it in quite that light before. Our bright-eyed-at-birth Aaron who had all the promise in the world…….our first-born…………our son………was one that people now see with his special needs group out in town. And while we love and accept Aaron, and we are very thankful for what makes Aaron – Aaron………well, mostly…………it was just a very firm reality check for me that day. For the past few days I’ve been thinking about what I was like when I was young and life was full of promise. High school and college days were wonderful. All of us had so many good times with all the fun that goes along with youth. I remember nights in the dorm with my girlfriends as we talked about boys and dating and marriage. No one ever thought about facing life’s serious issues someday. If such things ever did happen, it would be very far away……..and would probably happen to someone else……….never us. Later, we were starry-eyed brides with our handsome grooms…….or single with a career or ministry. Many of us shared news of babies and jobs and life. None of us ever dreamed about cancer…….saying goodbye to a spouse or child way too soon……..divorce………losing everything……….wayward children………a special needs child. And I know that what we tried to teach our children, and what I tried to instill in girls I have taught in Sunday School, is very true. We must have our knowledge of Who God is firmly rooted in our hearts before the realities of life hit us full force. Know God. Know His character. Know His love. Know His promises. Then some night when you’re looking at your son laying on the couch, like I was, and you’re struck with the harsh reality of how things really are………….or you’re standing beside a coffin………or you’re looking at divorce papers…………or you’re reeling from yet another heartache caused by your wayward child………..or you’re voted out……….or you’re signing foreclosure papers…………you can reach out and grab the only absolute that is there for that moment. God, and Who He is. Maybe you’re even angry at Him, and don’t understand anything at all……….but you do know that God is Who He says He is, and that He will be all that you need at that moment, and for the moments still to come. Learn it early and learn it well, because if you live long enough you WILL need to hold on to this God Who loves us more than we can ever love another……….even more than we love our Aaron. Aaron and I were watching Wheel of Fortune after supper last night when he decided to run upstairs to get something from his room. He had just started bounding up the stairs when I heard the louder than usual thump……….the sound that told me Aaron had fallen on the stairs. I waited for a few seconds, then heard him groan as he got up and proceeded to tell me that he had fallen but that he was fine. He went on to his room, and then returned to sit beside me and go over his list of hurts from the fall. He pointed to a place on his leg that looked somewhat like an old bruise to me………then to another place that may have been a recent scrape……..and to a finger that I know without a doubt had nothing to do with the loud thump on the steps. Aaron tends to point to every bruise, scrape, scab, and hang nail when he falls – trying to convince me that he is seriously injured. This is why it’s hard to know when to take his complaints seriously. “Oh, and my toe,” he said as he pulled off his slipper and his slipper sock. “My toe hurts!” And indeed it did look a little puffy already, but still I wasn’t positive. As the night wore on, he limped around the house, and he still told us about how badly his toe hurt. Aaron has a high tolerance for pain, but he does love to bemoan over and over about the fact that he is hurting. Therefore, after listening to his nearly constant run-down of his injured toe, my tolerance for his pain was low………very, very low. I was glad when I was finally able to close his bedroom door after several good-nights, and is it going to rain, and I hope I can sleep with my sore toe, and did Dad turn the heat on, and what’s the outdoor temperature, and my toe is very sore. “We’ll talk in the morning, Aaron,” I said, and breathed a sigh of relief as I walked up the hall. He was up early this morning, before 7:00, and very slowly made his way down the stairs……..two sets of stairs………to find me at the computer. Of course, before I could even ask about his toe, he launched into how his toe hurt and how hard it was to sleep. I looked at his toe, and sure enough it was red and swollen, with a small lump on top. I texted Andrea for advice and she said he should be seen because a broken big toe is more serious than any of the other toes. This pleased Aaron greatly. Now he was being taken seriously, he thought, and besides………this would mean another day at home and another doctor visit and maybe lunch out and plenty of attention. Finally, after lots of his sighing and continual reminding me of just how sore his toe was, I told him to stop talking about it. Yes, I did. Sometimes he has more drama than a pre-teen girl when it comes to his aches and pains…..and I was in no mood, even after two cups of coffee. He didn’t mind, though, because by then I had made him an appointment at the air base clinic and he could see his fun day taking shape. I told him to go upstairs and take a shower, and to be careful in the tub. The tub in his bathroom is an old cast iron tub that we had re-lined, and it hit me that perhaps it was a little slippery, though I didn’t think so. To be safe, though, I asked him if his tub was slippery and he replied, “Only when there’s water in it.” I just stood there staring at him and he was totally oblivious, which made it even funnier. Then off he lumbered up the stairs, leaving me to my laughter and my coffee. I hurried back downstairs to do a couple more things on the computer when I heard his water turn off. It wasn’t long before he came slowly down the stairs and then was at the top of the stairs that come down to where I was. I told him not to come down those stairs……….that he didn’t need to be going up and down all these stairs with such a tremendously sore toe. 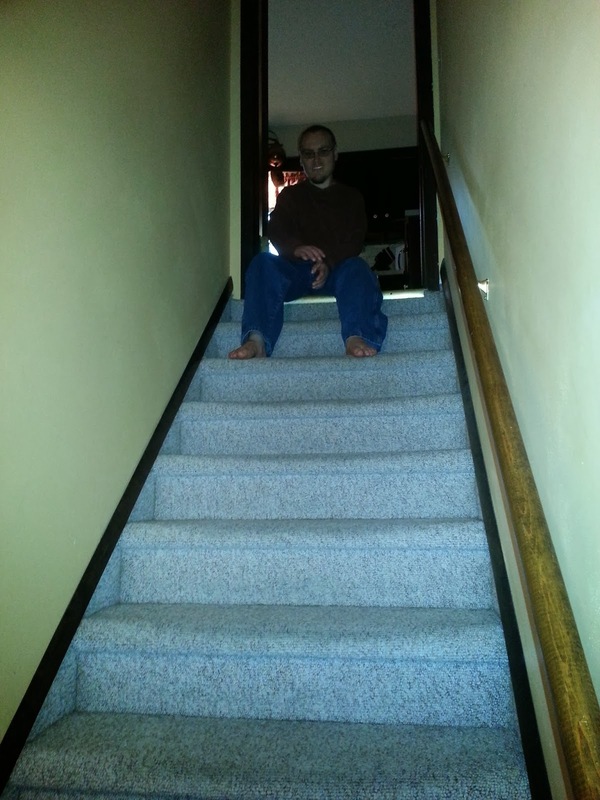 But Aaron wanted to talk, and Aaron is not easily deterred……..so he sat at the top of the stairs and carried on a conversation with me, even though he couldn’t see me. I tried to listen to him, though only half-way at best, but he either didn’t notice or he didn’t mind…..because he continued to chatter away. Finally, as I was nearly ready to come upstairs, he began to talk about dogs and how they see. “Mom, how can Jackson see in color but his eyes aren’t in color? Ours are white and blue. Some other dogs – their eyes are in color. How come his aren’t? His are black and brown so how can he see in color?” My goodness, the things that come to Aaron’s mind! Later, as I was cutting his toe nails……..since the doctor would be looking at his toes, you know…….he was busy looking at himself in the mirror. “Mom, what’s that string on my tongue?” I looked up as he opened up his mouth and lifted up his tongue to show me the string. I’d rather talk about Jackson’s eyes. As we drove to the air base through the rain, we heard the song that I am sure is Aaron’s theme song if there ever was an Aaron theme song……….Talk About Me. He laughs at that song, and so do I, but he doesn’t know that I have more reason to laugh at it than I am saying to him. “I wanna talk about me, I wanna talk about my, I wanna talk about my, me, my, my, my…….” Oh yeah, the perfect Aaron song! “Well, our steps are fuzzy and I fell on them,” he explained. That would be carpet on the stairs, and the carpet had nothing to do with your fall, Aaron. There followed the toe exam, and the instructions to go down to X-ray……and then the information that the clinic was only working half a day today, and would close at noon. But the doctor assured us they would hurry and try to have the X-ray looked at and a decision made before we left. We got the X-ray done, with Aaron sighing profusely in the waiting room and again on the table because now he knew that the clinic was closing at noon………and high noon was coming all too soon. But lo and behold, out scurried the doctor with the good news that Aaron’s toe was not broken but probably just sprained, and we listened to his instructions about how to care for the injured toe before heading for the door……….after all, it was AFTER the noon hour and we must go!! We had a quick and happy Burger King lunch, and then drove home through the rain/snow mix, where Aaron got a cup of hot chocolate, and was able to take his shoes off and rest his sore toe. He got busy on the computer, so I also got to rest my sore ears from all his talking. But really, life would be pretty dull if I didn’t have Aaron’s talking……..at least SOME of Aaron’s talking. Don’t want too much of a good thing, right? My, me, my, my, my………. Aaron and Rosie…….Not Too Rosy? Today Aaron stayed home from his day group. No, he wasn’t sick and he didn’t have any seizures overnight. It’s actually more complex than that. It concerns an issue that is requiring us, and others involved, to have wisdom and understanding……and not only for Aaron. 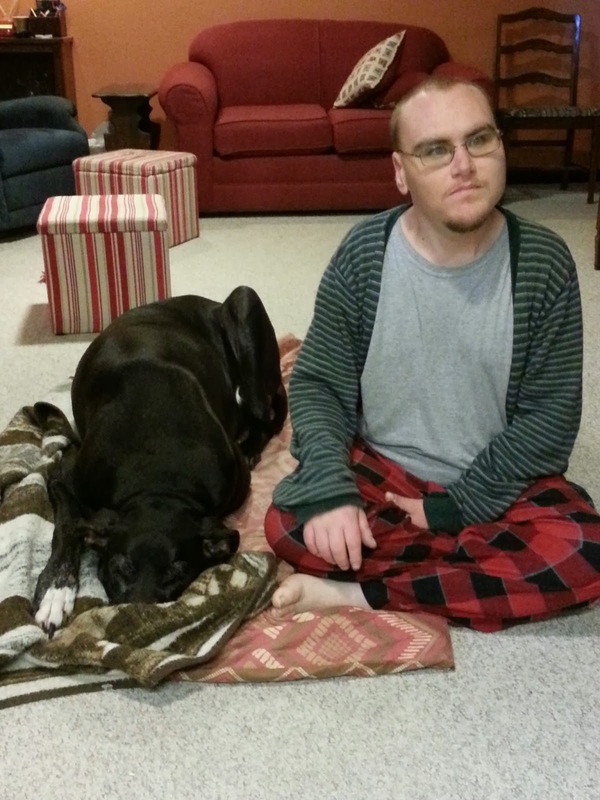 This matter involves Rosie as well………Rosie, Aaron’s very special friend. I first wrote about Rosie two years ago. Here’s the link to that blog post: http://hesaidwhatks.blogspot.com/2011/10/aaron-and-rosie.html. Aaron and Rosie have continued to maintain a very special relationship…………….going to each other’s birthday dinners with parents, staying near each other at Paradigm, and usually going on the same outings with each other during their day at Paradigm. It’s been sweet to see their friendship grow……and it’s been interesting to work with Aaron as he’s tried to understand their relationship, and whether they MUST be boyfriend/girlfriend or can they just be good friends. What has been occurring recently involves two issues. The first issue is Aaron’s desire to give or to buy Rosie things. We have allowed him to bring her a bottle of juice or some baby carrots or some other food item from the house. Sometimes we let him print her a picture on the computer of one of her favorite characters from the movie Cars or some other movie that she likes. He likes to share his movie popcorn with Rosie, or to buy her a snack when they are out. The second issue is wrapped around the matter of crayons. Yes, crayons. Rosie loves crayons. I mean, Rosie ADORES crayons. She lives and breathes for crayons. I had no idea how strong her love of crayons was when she and Aaron first became friends. I just knew that Aaron was sneaking our old crayons out of the house in the mornings and taking them to Rosie at Paradigm. If I knew then what I know now, I would have put a stop to that. Anyway, Louise and Leroy, Rosie’s parents, have through the years developed a system to help control Rosie’s crayon obsession. She is allowed to only have a certain number of crayons at definite times. The more crayons that Rosie has, the more frustrated and obsessed she becomes with getting more crayons. It’s a vicious cycle, and Leroy and Louise have worked out the best system to help keep the crayon dilemma under control. Lately, though, crayons have somehow become a huge issue once again. I know that Aaron bought Rosie some crayons when they were out together with their group, and that it happened more than once. We repeated to Aaron over and over that this was not allowed. Rosie began wanting more and more crayons, of course, and so things began to snowball. Rosie wanting crayons……Aaron saying no……….Rosie becoming frustrated. One day when Aaron was afraid that Rosie would get in trouble at Paradigm, he told me, “Mom, I wanted to take Rosie’s blame!” I just stood there, wondering how to answer that amazing statement from Aaron……….admiring his care for Rosie, but knowing that Rosie also needed to learn that she couldn’t have all these crayons. Not long after that, Aaron came home one day and again was frustrated. “Mom, I’m tired of bringing my wallet now. I expected to have a fun day!” Once again I told Aaron that he had helped create all this by repeatedly buying Rosie things, especially the recent crayons, but instead of responding with understanding, he replied, “Can you understand my day was spoiled? !” And can you understand why, Aaron? Can you? Maybe a little? Things came to a head yesterday in the mall, with Aaron buying the biggest ice cream that he could in order to spend all his money, and Rosie wanting her crayons. I don’t know all the details, but there was a meltdown from poor Rosie in the mall. 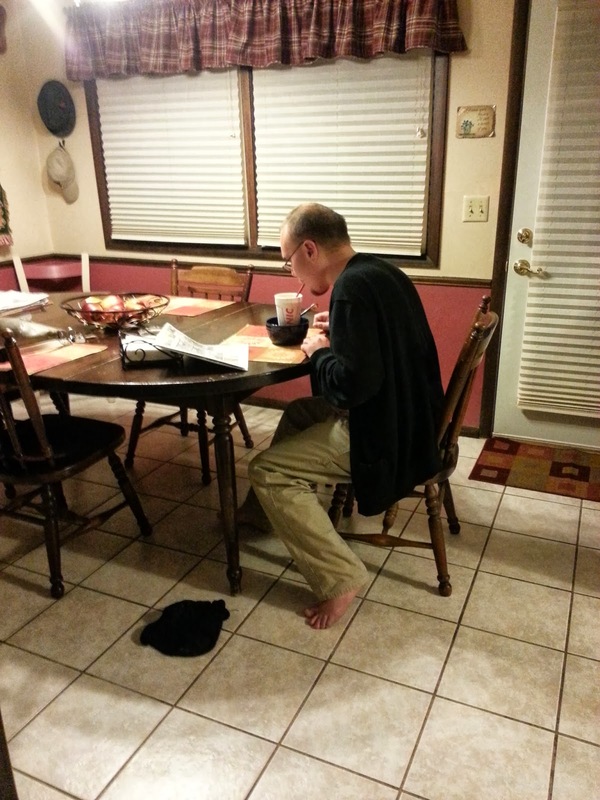 And here at home later that evening, a frustrated and sad Aaron had his own form of meltdown that prompted me to go buy him some jelly beans that he wanted………hoping that he would calm down and engage in some conversation as he saw his anticipated jelly beans waiting on the table. Jelly beans………..crayons……..but instead of two young children squabbling over these items, we have two young adults to whom jelly beans and crayons mean the world. Jelly beans and crayons hold the key to happiness for Aaron and Rosie at this point in time. I tried to get Aaron to sit still in the family room and talk to me, but he kept getting up and pacing around the room as he talked about this problem. Then he finally sat down on the ottoman near where I was sitting on the couch, and the tears came. He tried to wipe them away, but they still welled up in his tired eyes. And as he talked, I realized that Aaron was somewhat frustrated with Rosie but he was also sad that they are at this point with each other. He is upset that he is feeling this way toward his special Rosie, and he doesn’t know what to do now that things are not all rosy with Rosie. It’s so very hard to reason with Aaron the same way that I would with Andrea or Andrew. I told Aaron that his feelings are not at all unusual, and that all friends or couples go through these times. I told him that his dad and I have times of irritation with each other, but that we work it out and then everything is fine. He would listen, but then go back to repeating the same words over again that he had just said……..and I knew I wasn’t making much headway into that head of his, at least as far as I could tell. And I know from talking to Louise that it’s the same way with Rosie. They just don’t get it……….although we keep trying and we keep hoping. But their disconnect mentally is very evident in this delicate matter of working through the junk that sometimes mires a relationship. I wasn’t surprised this morning when Aaron came downstairs and plopped on the floor beside Jackson, and said that he didn’t want to go to Paradigm today. I was on the computer and I turned to look at my boy who is a man, but who is really still a boy………..a boy/man who is working to understand himself and to understand Rosie. I know that I can’t dismiss his repeated conversations about what has happened, even as I can’t dismiss the obvious pain of this lesson. I once again assured him that he and Rosie are still very special friends……..that Rosie’s mom is going to work with Rosie on all this……..that the staff at Paradigm will work with both Aaron and Rosie to help them along………..and that his dad and I are always here for him. I talked to Louise today and was so thankful for her kindness and her understanding. Of course she is………she has walked this path for many years, too……….this path of mothering her special daughter who is now a young woman but still a child. Together we hope to walk beside our Aaron and Rosie, helping them solve this crayon problem that is every bit as serious as if we were helping our children solve a deep relationship problem that might threaten to dissolve a marriage. We both value the unique friendship that Rosie and Aaron share, and we wouldn’t want to see their happiness disrupted over anything………including crayons. All the while, Louise and Leroy have the crayon dilemma to address concerning Rosie……….and Gary and I have the “I want to buy Rosie something every day” dilemma with Aaron. I told Louise today that I feel a bit like a meddling mother-in-law………and we laughed at that thought. At least Rosie and Aaron won’t see us as meddling, so I can breathe easy. Author hesaidwhatksPosted on October 17, 2013 February 28, 2016 Categories Adult Autism, Asperger's Syndrome, FriendshipLeave a comment on Aaron and Rosie…….Not Too Rosy? Today was the day for our annual meeting with Aaron’s case manager, Carissa, and with Barb from Paradigm. We meet at Applebee’s in order to make the meeting more fun for Aaron, because if a meeting involves food then it is automatically more tolerable than just a boring meeting sitting around a table and signing forms. It’s amazing how quickly these meetings roll around………..how fast time goes by from year to year. So far things are well set for Aaron, and so these meetings aren’t really a huge deal. We have to correct some things on his paperwork like new meds or meds that he’s no longer taking; new doctor info; and of course this year put a brand new, much lower weight down for Aaron. Carissa was shocked to see the new, slimmed down Aaron……and Aaron was happy about that, although he was too busy looking at the huge Halloween spider stuck on the front of the counter near the entrance, and so he didn’t comment. We’ve learned over the years to have our own plan of action concerning the post-meeting issue of getting Aaron to return to Paradigm. In other words, if Aaron is with Mom for even a small fraction of the day, then he thinks that it’s his right to return home with Mom and not to go to his day group. Between Barb and me, we’ve learned to cover all the bases………telling Aaron that yes, he is riding to Applebee’s with Mom for the meeting; and yes, after the meeting he gets to ride with Barb back to Paradigm; and yes, you and Barb will stop at Quik Trip on the way to Paradigm. Notice how positive we are? I also use some strategies at home, such as……….yes, you can have the computer keyboard put in before we leave if you are nice (or at least moderately nice, but I don’t say that to Aaron. ); yes, you can have some money for getting a snack today (but do not buy Rosie crayons or give your money away to anyone); and yes, you have time to watch the old movie version of The Thing before we leave. He pushed a bit against our plan and was on the verge of losing his privileges, when he finally went in his room again and shut his door. Thankfully, he calmed down and the rest of the morning was mostly pleasant. He said he showered, but his hair didn’t look great so I’m not sure. However, he smelled of deodorant…….although a different smell than his usual. Barb cleared that up later by asking Aaron if he still had the deodorant that he put in his pocket at Paradigm and brought home…………and which is the community deodorant. Oh my! This was the different odor I noticed. Community deodorant………and Aaron smiled proudly as he said that he did indeed put on his “new” deodorant today. It is now in the trash. At Applebee’s, as Aaron waited for his house salad and his chicken strips to come, he put a whole pack of sweetener in his mouth. He loves sweetener, and if left alone he would swallow paper and sweetener both. Yuck! I told him how bad this was for him and how sick he could become, so up he hopped as he spit the package into his hand and headed for a trash can……….a trash can that was in an area where there were little beverage napkins stacked. He proudly returned with a stack of small napkins………and it wasn’t long before he got up again and with purpose returned to the napkins and walked back with another hand full. 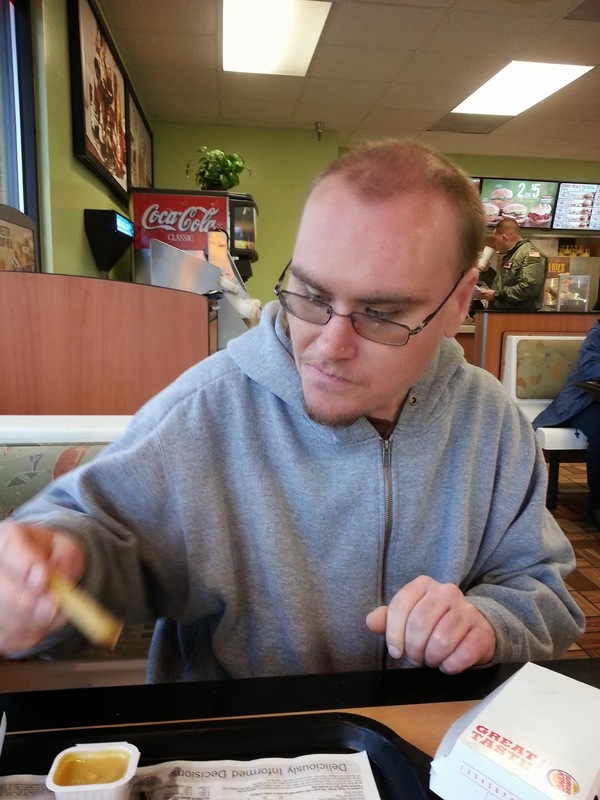 His need for napkins was satisfied……..as was his need for toothpicks, I learned later, as he emptied his pockets and dumped his toothpicks on the table. Between these today, and the ones he got at TGI Friday’s last Wednesday, he shouldn’t need new toothpicks before Christmas. No, Aaron, you need to do less spending! But this fact never computes with Aaron, although I will keep trying. And as I think of it, she’s so right. There are times that Aaron pushes every button that we have, and then somehow finds even more to push. But really, there are many reasons to be thankful for our Aaron……….and a big one is for how he makes us laugh, even sometimes between our gritted teeth and rolling eyes. We have one more meeting next week, and then we’re done for another year. Done with meetings, that is. I don’t think we’ll be done with Aaron……….not by a long shot. 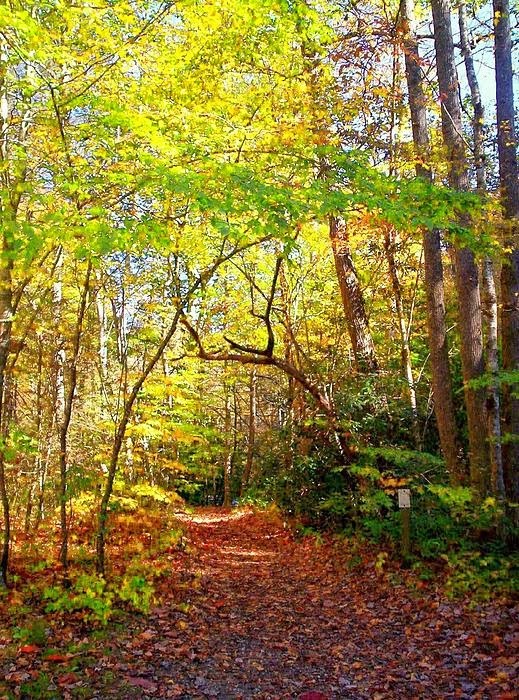 Every autumn when we were young, when the leaves were vibrantly colored and the mountain air was crisp in my home state of West Virginia, Dad would set aside a Sunday afternoon for our annual long trek through the woods. I’m sure that Mary Beth, John, Jan, and Kathryn remember that special tradition as well. Dad would take us up in the woods behind our old house in the Elmore addition and off we would all go, following Dad as he led us on the road or the path through the trees. Dad worked six days a week, so I know it was a sacrifice of his time to take us on this outing. He would point out the various trees by name, telling us interesting facts about each species. He would stop and tell us to be very quiet as we listened to the forest sounds around us. We would listen expectantly………waiting……….waiting……….until we heard the unique chirping of a squirrel, or the rustling leaves caused by a hopping rabbit, or the unmistakable shrill of a Blue Jay or a hawk. Dad wanted us to not only have fun on this walk, but to see and to learn from all that was around us. Eventually we would end the day sitting on the ground of a sloping hillside, enjoying the wonderful sunshine and fresh air…………and time together as a family; although that is a treasure that is relished now, I’m sure, more than it was at that particular time. I don’t remember how long we were in the woods. Time was irrelevant as a child. It seemed like forever, but I’m sure it wasn’t all that long. I do know that if I had been in those woods alone, I would have been terrified. But with my dad leading the way, and with my siblings around me, I never had a doubt or fear. I was secure and carefree, loving the experience and trusting in the guidance of my dad. David is asking God to lead him in the right way – that’s the first request he makes. God, show me the way to go……..the right way. And why? Because all around there is danger. There are enemies who want to trip him up, even to kill him. But isn’t it interesting that David first asked to be led in the right way before he asked to be led in the safe way? And that David didn’t ask to be delivered OUT of the way of the hard stuff, but to be led IN the right way IN the midst of the hard stuff. “Make Your way straight before me”……….doesn’t sound like David was asking for a detour around the situation, but a straight way through it. Lord, lead me in the right way………because of all the junk that is pulling me down. Make your way straight……….through all the questions and the hurt and the loneliness and the darkness. Step by step, just lead me on the straight path in front of me step by step. There are times I wish I had all the answers, either for myself or for others, but I don’t. Yet I do know that I need to take one step…….then another step……….then one more………and all the time, ask God to lead each of my steps in the right way. I wish life was full of fun, but sadly that isn’t the case. Yet in the hard times, there are things to learn and growing to be done. 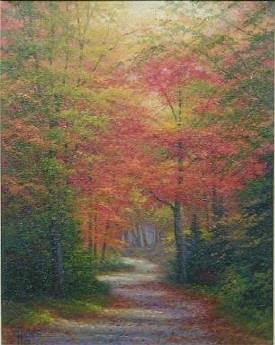 Someday I’ll sit down and rest, looking back on the path through the woods and thinking of all the lessons learned. And realizing that God did indeed lead me in the right way and the straight way.